Visualization from Phototrails (2013), Lev Manovich, et al. Interviewing Lev Manovich is like data mining one of his sprawling visualizations. Our hour long networked conversation generated over 7,000 words reflecting Lev’s extraordinary journey into the life of data. The 1,400 word version, Painting With Data: A Conversation with Lev Manovich, is now out on Hyperallergic. Eventually I’ll release the uncut version. Lev’s analytics run deep: probing the relatively unexplored narrative territory of social media visualization, catalyzing the potential for tapping into new revelations about the contemporary social condition. 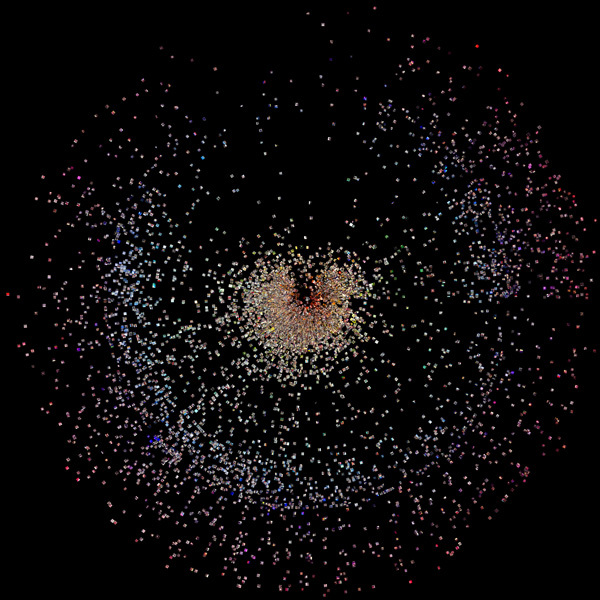 These expansive, rich visualizations and otherworldly constellations of media culture tell a story, a collective narrative, chronicling extraordinary moments in historical time such as political upheaval, the everyday patterns of urban life, and even the seemingly trivial details of the selfie obsession. But as Lev explains, he is ultimately an artist whose expressive medium is the world of data. These highly statistical data-driven renderings generate forms of visualization that reveal a certain beauty emerging from the complexity of media utterances distributed in time and space. The question we explore in our interview: is this visual art, is it journalism, documentary film, social science, political activism, or perhaps all of the above. That is what is interesting about Lev’s work. Together with his interdisciplinary collaborators, he operates in the interstices between all the various disciplines. It is an investigation that defies definition and genre specificity, to the point of blurring the very nature of his own work as an artist, theorist, and computer scientist. As it should be. For to chronicle our increasingly mediated culture as a “painter of data” seems to me to be entirely in tune with the landscape of our time.